The other day I witnessed what I would call one of the most pathetic attempts at a sales call I have seen in quite some time. I was visiting a new home community and waiting for my appointment to meet the sales rep. Although this builder has their own mortgage and title company, the sales rep had contacted me because of my experience and reputation working with Boomerang Buyers. As I sat there waiting for her to finish her meeting with the person in the room with her I could not help overhearing their conversation. The person speaking was clearly a loan officer. He was well dressed and seemed to be handing her paper after paper out of his folder. After about 15 minutes he left with his head slightly bent as if he had just gotten kicked in the stomach. As sad as this sounds I felt amused and sad for him all at the same time. I give him credit for trying to break in to a new home development knowing that the company has it’s own in house mortgage. Now only are they obviously the preferred lender, but the builder gives buyers a $10,000 incentive when you use their mortgage and title company. This loan officer made a critical mistake and it’s important for you to go back to all of your marketing and promotional pieces and realize one important piece of information. This is so crucial to your success that I would suggest taking out a pen and paper and writing this down right now before reading the rest of this article. YOU MUST KNOW THE STATION EVERY HUMAN IS TUNED INTO. We are all selfish beings and are tuned into W –I-F-M. These letters stand for WHAT’S IN IT FOR ME? This loan officer was literally vomiting all of the reasons this builder rep should do business with him. He told her about all of the programs he offered. He told her how competitive his rates were and what a high level of service he was able to offer. He never stopped for a second to even ask her anything about herself. He did not ask her about the project itself. He truly never stopped talking. The first lesson of course is to ask and listen. Resist the urge to speak as difficult as that may sound. In my www.lounfairedge.com program I discuss the persuasion and manipulation ( they are not dirty words) in great detail. But the key is listening 90% and speaking only 10%. It’s very hard to sell someone a service when you don’t even know what they need or if they even have a need. In this case this builder rep already had an in-house solution that was the preferred choice. If you are able to listen and asking probing questions you can discover a need before you start spitting out all of the reasons they should give you a try. HOW DID MY MEETING GO? I left the meeting with a big smile on my face. To begin with this agent requested the meeting with me which automatically put the power on my side of the meeting. She had heard about me from some of her peers. She had seen me on TV and had attended one of my classes on working with Boomerang Buyers at the Board of Realtors. I didn’t have to tell her I was an expert, she already knew that since I had positioned myself correctly. But what was truly different was that I asked about her. I wanted to know how long she had been in new home sales. I wanted to know how the project was going in terms of traffic and offers. I asked her if she needed any assistance and if so what did she need. SHE TOLD ME EXACTLY HOW TO SELL TO HER. This project is in a middle class area of town and is slightly above the average sales price for the area. Her in-house lender does not offer first time buyer bond programs and apparently they are very strict with their underwriting and have many overlays. THE OTHER LOAN OFFICER HAS NO IDEA OF HER NEEDS. During the rest of my time with her, and ONLY AFTER, learning her needs, I was able to walk out of her office with 3 prospects to call. We agreed , at her request, that I stop by at least 1 day a week just to check in with her. The bottom line is that she wants to sell homes and I want to close loans. This is a win –win and satisfies the WHAT’S IN IT FOR ME for each of use. But it doesn’t end with this meeting. 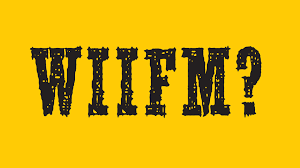 The buyers you will meet are all tuned into the same station WIFM. No one wakes up in the morning and decides they want a mortgage. Listen to your buyers. Ask them questions. What’s important to them? Is it the monthly payment or the amount of cash they need at closing? What are their goals? You can ‘t sell anyone anything until you know that person’s W-I-F-M. THE BEST REALTORS TO WORK WITH AND SOME EASY WAYS TO FIND THEM. Have you ever wondered if there is an easy way to determine which Realtors you SHOULD work with and which to avoid. Yes, you read that correctly and it’s not a misprint. There ARE Realtors you should be avoiding but more on that in second. Last Tuesday I met with Tracey who is a seasoned Realtor. I met her because she attended one of the classes I taught on Boomerang Buyers at her Board of Realtors. After the class she came up to me , as did many of the other 37 agents who attended, and gave me her card and asked for mine. This in of itself is a powerful lesson. SHE SAW ME AS AN EXPERT NOT A DESPERATE ORIGINATOR BEGGING FOR BUSINESS. Tracy called me a week after the class and honestly I had already forgotten about her other than a note I had made to myself to put her on my contact list. What’s important to realize is that SHE called ME. This is a critical piece of the puzzle when you are trying to establish a new relationship with a Realtor, Builder, or other referral partner. To be clear, your job is to create more demand for your services than you have time for. I hope you have written that one down . LUNCH WENT WELL BUT IT WAS DIFFERENT THAN THE LUNCHES YOU MAY HAVE. After some small talk back and forth Tracy finally opened up and told me the reason she had asked me to lunch. What she didn’t know was that I had already done my homework before ever agreeing to have lunch with her. I looked her up on her company’s site and I then went to homelight.com, Zillow.com and Franklymls.com to see what her stats were. Was she doing mostly listings or working with buyers? Was she a rookie, a superstar , or a mid level agent. Turns out that Tracy was exactly the pro-type agent I search for. The lesson here is that not all agents are or should be on your radar. The agents I prefer are the mid level agents. Top agents always seem to be too hard to get to but more importantly they don’t seem to value the relationships. They are way too busy and just want their deals done regardless of how that needs to happen. Keep in mind I am making generalizations and these may not apply to all cases. I also don’t spend time trying to attract part time or total rookie agents. They require a large investment of time and as we all know these are the first group to leave whenever there is even a slight change in the market. SO WHO IS THE IDEAL AGENT ? My ideal agent is full time and has been in the business at least 3-5 years. They are doing well but they are ready to kick it up and take it to the next level. Generally they are doing 7-10 transactions or more each year which puts them solidly in the middle. BACK TO TRACY AND WHY SCRIPTS RARELY WORK. Once the small talk was out of the way she began to tell me that she had heard good things about me and had been impressed with my seminar. The lender she had been dealing with just dropped the ball on 2 deals. Her feeling was that he was taking her business for granted and she was upset. I asked her questions about her business. What she expected and needed in a lender. How did she market herself and her properties. What were her goals for the rest of the year and the year after. Tracy talked for about 45 more minutes and I did not say one single word. PLEASE RE-READ THE LAST SENTENCE. I think it is very important to realize that there are no scripts for speaking with people. There are outcomes you want to see and structures for getting to those outcomes. The issue with scripts are that they make you seem to rehearsed and unnatural. But even worse is the fact that rarely will the other person stick to their end of the scripts. Just be yourself. It’s always better to be asking questions and learning what the other person’s needs are. They will tell you if you can just keep your mouth shut and listen. IN FACT THEY WILL TELL YOU EXACTLY WHAT THEY WANT AND HOW TO SELL IT TO THEM. It’s often difficult to keep quiet but it is critical to your success. There are 3 ways that every human makes a buying decision and you must clearly listen for that que. Once you know those que’s you are able to offer your services or program to them using the knowledge you just gained. I cover this in great detail in the www.LoUnfairEdge.com program. People need to either hear-see –or feel. After Tracy finished talking I told her that I was very impressed and that she seemed like a great agent with a solid plan. But I also told her that I was at my maximum with the amount of preferred Realtor partners I was working with and would need to review the list when I got back to my office and see if I could replace one of my partners so I could add her. SHE LOOKED LIKE SHE HAD BEEN SLAPPED IN THE FACE. Like most Realtors, Tracy truly did not expect that response from me. She was totally used to having loan officers chase her, beg her, and go thru hoops to try to earn her business. Most loan officers just start vomiting a list of all the reasons they are great, their company is great and why the Realtor should use them. My approach was completely the opposite which is why it is so effective. Tracy is now on my preferred Realtor list and we are doing business together and closing deals. She is very happy with our services and would not think of using any other lenders. That is mostly due to the fact that we do a good job but more importantly the entire arrangement was orchestrated from her knowing who I am ( teaching) to meeting me, to then feeling grateful that I put her on my list of partners. Yes, I know you might find this difficult to implement or even comprehend but try it for yourself and let me know your results. http://www.toporiginatorsecrets.com/wp-content/uploads/2016/08/3-realtods.jpg 138 364 Brian Sacks http://www.toporiginatorsecrets.com/wp-content/uploads/2016/12/8.png Brian Sacks2016-08-01 12:12:562016-08-01 12:12:56THE BEST REALTORS TO WORK WITH AND SOME EASY WAYS TO FIND THEM. Can A Loan Officer Have An UNFAIR Edge? We are all in a tough business. Most of us have all of the same programs and all of our rates are pretty similar. We can all market on facebook- and linked in and send mail etc. That’s part of the reason we are only judged on price because we all look the same. The UNFAIR EDGE comes into play when you are speaking to Realtors- Referral Sources and Prospects. What THEY say and the words they use to say it matters and can give us clues on how to sell to them. You must know how to persuade and manipulate if you are going to be successful. These are not dirty words at all. Here’s a new program I just put together and it’s all about how any loan officer can gain this unfair edge. Truthfully these are all hard learned lessons over my 31 years in the business that will help you too. No theory – no fluff – but first you have to truly believe that knowing how to persuade and manipulate everyone you come into contact with is THAT IMPORTANT ! http://www.toporiginatorsecrets.com/wp-content/uploads/2016/07/the-edge.png 145 347 Brian Sacks http://www.toporiginatorsecrets.com/wp-content/uploads/2016/12/8.png Brian Sacks2016-07-16 20:05:192016-07-16 20:05:19Can A Loan Officer Have An UNFAIR Edge?